What is the best vacation that you have ever been on? What about the worst? With my husband and I’s 5 year wedding anniversary approaching, we’ve been considering taking time to get away for a few days. We were originally thinking about a 10-day cruise in the Caribbean but decided that at this time, it isn’t doable. We want to go somewhere though. While coming up with ideas, it got me thinking about some of the best…and worst…vacations that I have been on. 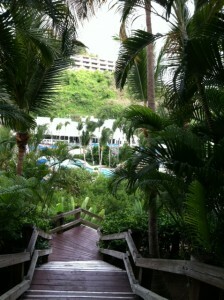 In June of 2012, hubby and I went to the Virgin Island of St. Thomas for a late honeymoon. It was a huge decision for us because we were at first going to road-trip across the country. (Are you noticing a theme here about our vacation planning?) When it came down to it, we realized that we would rather just relax at an all-inclusive resort and not have to worry about a thing instead of dealing with ‘stupid people’ on the road stressing out whoever was driving 3,000 miles from home. Back on point though, aside from the final few hours being a very bumpy flight across the Atlantic to St. Thomas in the middle of a tropical storm, the trip there was perfect weather and on schedule. 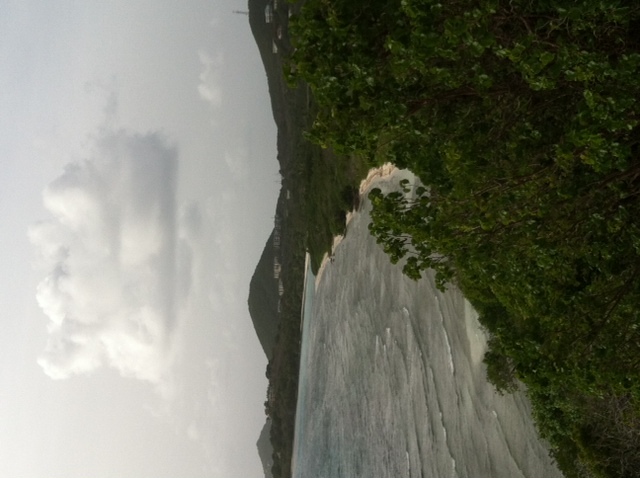 By the time we landed in St. Thomas, it was dark out, the storm had passed and we found ourselves being led into a van with about eight other people. A little nervous, scenes from Locked Up Abroad kept popping into my over-active mind. I cannot tell you the relief that I felt when the van dropped off the first set of people at their destination. 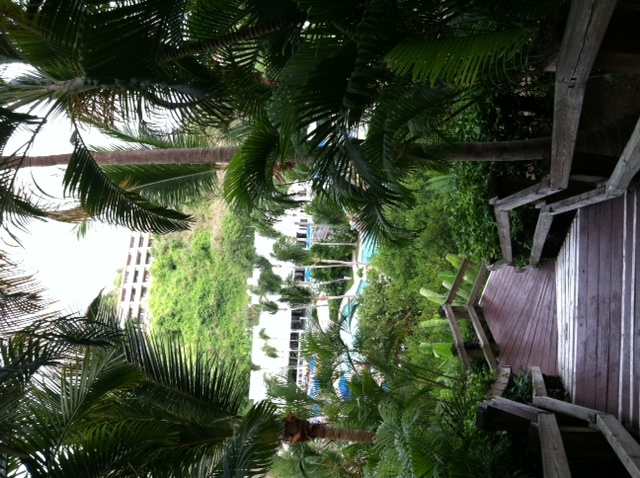 About half an hour later, we were pulling up to our own resort, Sugar Bay. Rain had started to fall again, and after we were escorted to our room, we changed out of our ‘fight clothes’ and into something presentable for dinner. Exhausted, we ate and headed right up and crashed for the night. The next morning we awoke to sun pouring in through our ocean-view window. The sight was like nothing either of us had ever seen before. Taking a moment to just savor it, we took our time getting ready to head to breakfast and then the pool/ocean to lounge for the day. We soaked up the sun for a few hours and enjoyed a daiquiri before going to the activities center to see what there was to offer. 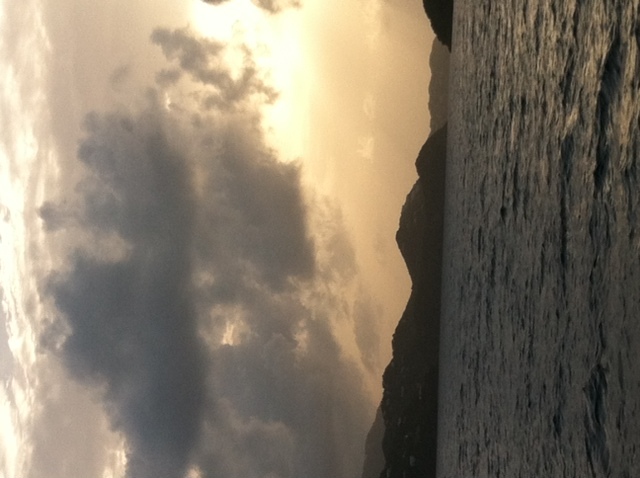 We settled on a sunset sail for that night and a half day cruise for the next day. 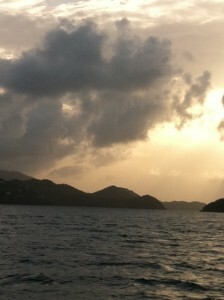 The sunset sail was absolutely breathtaking. We were on a small sailboat with three other couples and 3 crew members and we sailed around the waters for two hours as, you guessed it, the sun set. We both agreed that if we ever go back, we will do this every night. The picture below does not do it justice. The following day started out much like the first, except for the fact that we had to catch the boat at 11. This boat was a little larger, with about 20 people on board. This boat was a little faster too, riding the waves and rocking with them like some sort of amusement park attraction. Things calmed down though, and hubby and I decided to apply a round of sunscreen…our first and only round. The boat took us to the next island, where we were able to get out and swim in the crystal clear waters for about an hour. By the time we got back to the resort, we were excited that our Ohio pasty-whiteness was gone and that we would be going home with some color. However, several hours later, that color had turned into a full-blown sunburn. So severe that we were shivering and in the gift shop buying aloe and anything else that could relieve the pain. The next day was only worse. The trip home was brutal. Going through airport security and being pat down excruciating, and we didn’t dare put shoes on our severely burnt feet. Luckily, this flight over the Atlantic was smooth, and after landing in an airport that shall remain unnamed, we were relieved for a couple of hours to stretch out. Our 2-hour layover, however, turned into 3…then 4…then 5. There were severe storms in much of the country and flights were being delayed. We, however, were finally being put onto our flight, led on like a bunch of sheep to sit and wait on the plane…after they hijacked hubby’s carry on bag because it ‘wouldn’t fit’. We had already missed what would have been our connecting flight at airport #3, and after waiting for another two hours, we decided to get off and try to find another way home. We were told that if we got off, we would not be allowed back on and hubby would not be getting his bag back until after we landed…that it would be sent to wherever we were going…because come to find out, all fights going to New York had been cancelled entirely, as were dozens of other flights. Airports had closed down because of the storms. We waited in so many long lines with thousands of others just trying to find another way. Our only option was waiting until the next day to get out, and we would be going to Dallas before heading back to Ohio. That was the longest night of our lives. 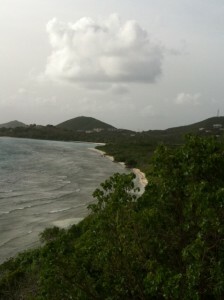 The airport had dropped to sub-zero temperatures, and considering we were just in the Virgin Islands and hadn’t planned on spending the night in a place where you could see your breath, we were not dressed for the occasion. And with hubby’s suitcase off to some unknown land, he had nothing else but what was on his back. Shivering and trying to cocoon ourselves into what we did have on, hubby finally went on a quest to find an open gift shop for anything and came back with two blankets that were paper thin, but at least helped preserve some of our body heat. And as we were trying to fall asleep curled up in an airport chair, we saw a night-worker cleaning the floors…in a winter coat, hat, and gloves. On a funny note, it took two years for our tan-lines to fade completely from our St. Thomas trip. I called it our perma-tan. Previous postPeanut Butter and Chocolate….is There Anything Better? Next postStrawberry Cheesecake Chimichangas…a match meant to be.